In Cape Craftsmen, like other home brands here at Evergreen, we curate our wholesale products into coordinated collections based on strong decor trends that we see rising in the market. By creating unified interior decorating statements in stores—across multiple types of pieces and multiple price points—retailers can take advantage of these trend looks to reach a wider base of shoppers. 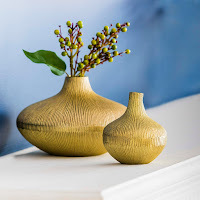 In this article, we’ll take you through the major trends in our latest Cape Craftsmen catalog release for spring 2019. Nature’s Vitality is one of our largest collections, and it builds on the successful “oasis” look that’s modeled from resort living environments. It's about bringing the gardens inside, to create serenity and awaken the senses. Whether it’s for stress relief, cleaning the air, or growing your own food, indoor plants are known to provide multiple health benefits, and consumers are becoming more and more interested in bringing plants indoors. Our Nature’s Vitality collection helps your customers capitalize on this trend with designs that are inspired by natural green botanicals, along with earthy neutral tones like terra cotta. 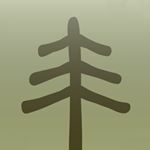 Here we showcase the beauty of natural plants, from wood-grain textures to tree shapes and leafy patterns. We capture the look of plants in pieces like our 30” metal floral wall decor, and we also provide several new low-cost options for growing real plants indoors, like our hanging pot holder. 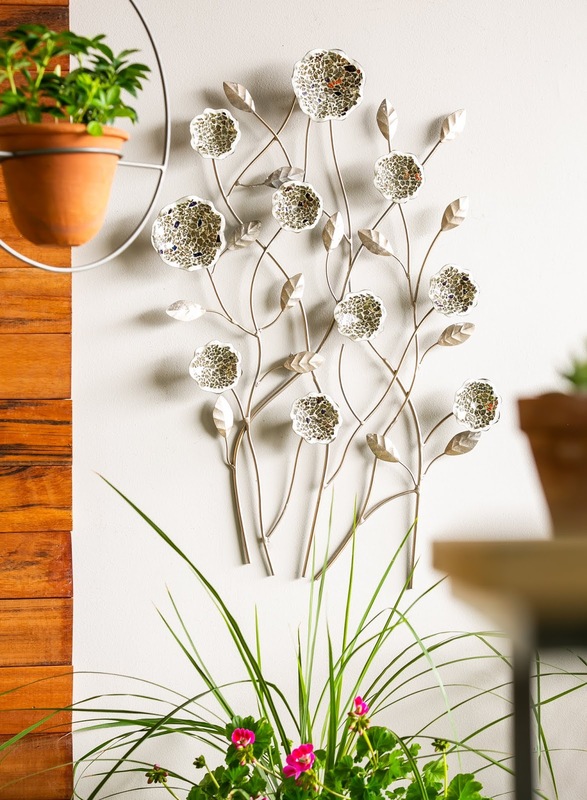 You’ll find other garden-inspired pieces here, like our beautifully-finished ceramic water fountains, and we incorporate other cues of nature in organically shaped décor and the bright colors of our roll-up polypropylene floor coverings. Nature’s Vitality is also where you’ll find some of our metal botanicals, in addition to the Gilded Garden collection we shared recently. Our metal garden stakes range in size from 4 feet tall down to 17” tall. We also include pieces with lots of practical function and weathered finishes for the outdoors, such as our our planter with chalkboard with bins that can be used for planting, or for storage in the home. We carried this philosophy into our Cape Craftsmen selection of wholesale products for home decorating with items that we feel will help to encourage and and create these types of feelings and situations. 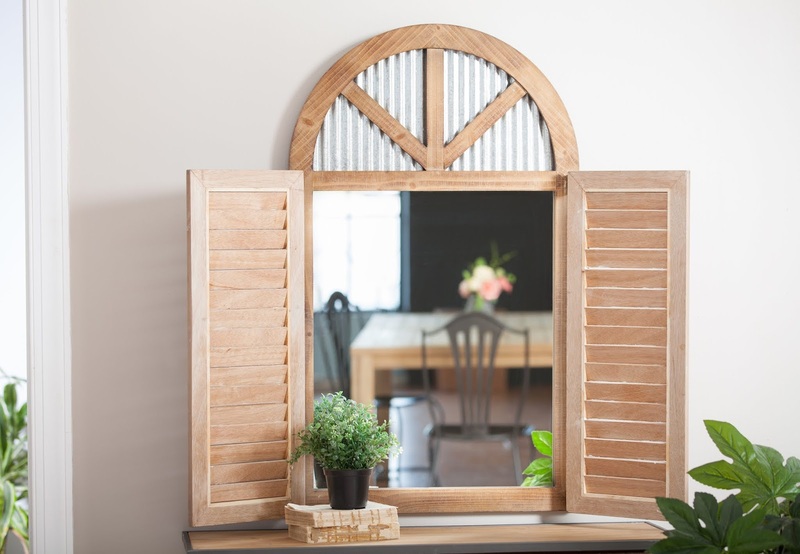 Our latest selections in this look can be used for casual entertaining, like our wood and metal mirror which includes shutters that open and close. 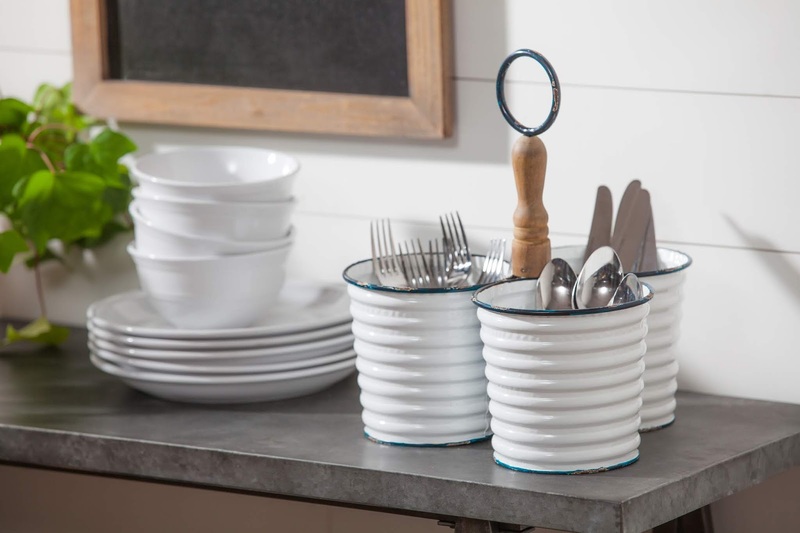 Our metal caddy with 3 compartments is helpful for storing kitchen utensils, or it can even make a great planter. Other future top sellers include should be our mixed material mirror or our galvanized metal lotus votive holders which include glass cylinders. Our Artisan Blues collection is built around the timeless color combination of blue and white, which has been popular in home decor for over 500 years. We bring together traditional patterns with Asian and Middle Eastern influences for a look that’s truly global. Gold accents work in perfectly with this collection, like our large, gold-finished bud vases which are made of cast aluminum. As a company, we want to celebrate the contributions of local artisans around the globe, and support their efforts by offering products for our retailers that have that unique, organic look to them that many shoppers in the market today are looking for. We have some great wall statements here, like our 18” metal clock. 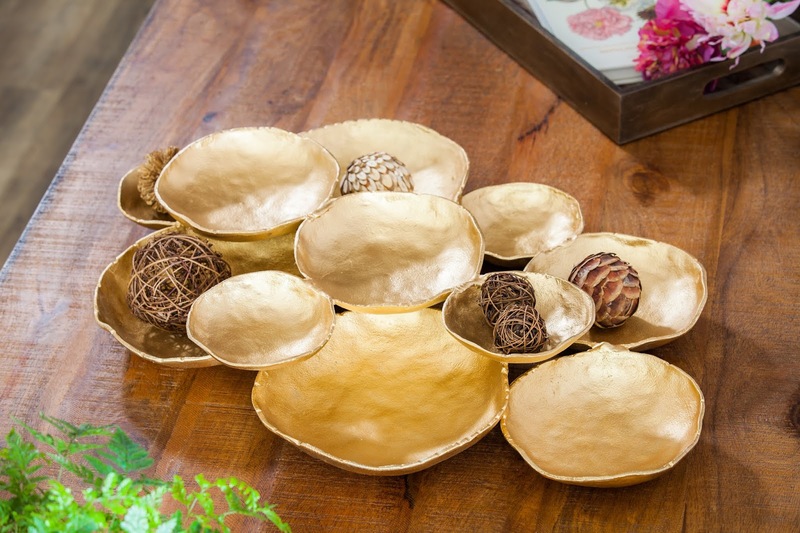 Our tabletop accents help complete the look, like our gold-finished grouping of cast aluminum bowls. There’s also a growing trend in North America of appreciation towards pets. Did you know that 54% of U.S. households own a dog, and 42% own a cat? So we put together what we think is our strongest presentation of pet-themed items in recent years. 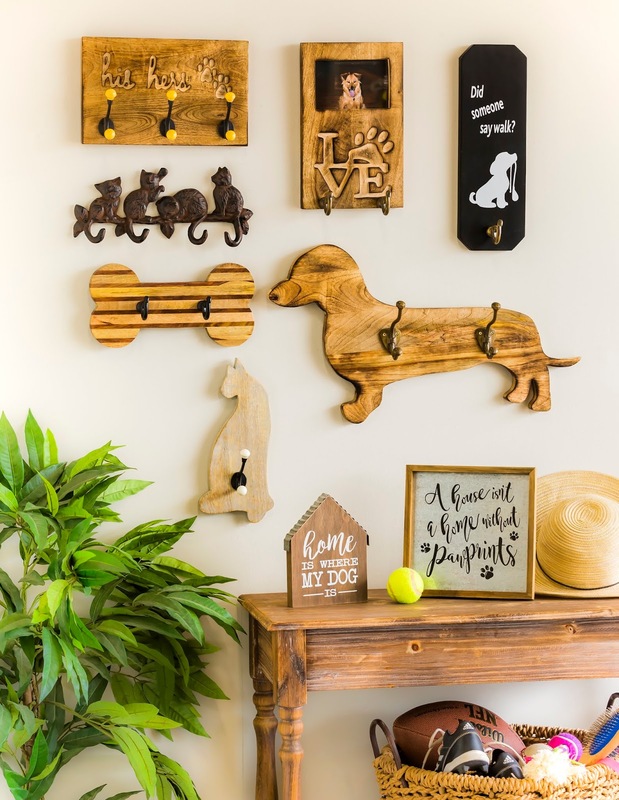 This group will appeal to all the pet lovers, with a selection of decor pieces, including lots of wall art, such as metal wall hooks and plaques with fun messaging. Whatever trend statement you might choose to build out in your store, we hope you’ll find everything you need across our family of home product lines, including Cape Craftsmen, Cypress Home, and B. Boutique. Retailers can shop all our catalogs online by logging in to MyEvergreenOnline.com.